Calling all Poodle lovers! 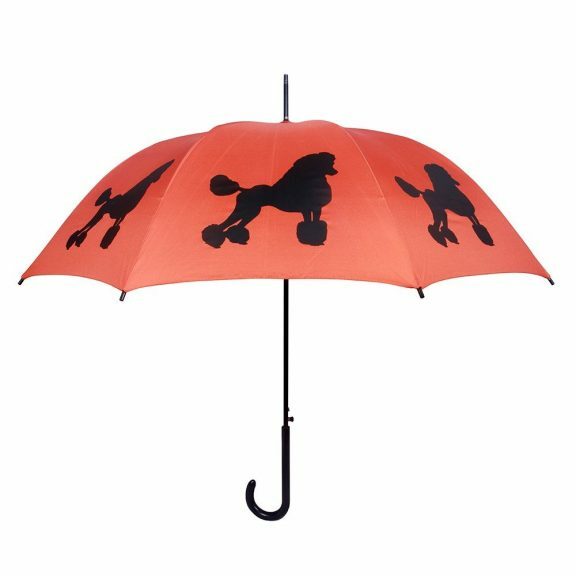 This fantastic poodle dog print umbrella will keep you or your poodle safe in the pouring rain. With striking black, continental clipped, standard poodle silhouettes on its rustic orange polyester canopy. Slim black crook handle and a 10 mm steel shaft, this really is one stylish umbrella. Featuring 8 flexible fibreglass ribs and auto-opening, you and your companion can stay dry at the push of a button. Thanks to its impressive 95 cm canopy span, you have more than enough room for a guest, be it human or dog! This walking style poodle print umbrella is 88 cm in length and is sure to brighten up anyone’s day! Not the one for you? Click to check out the rest of our animal art umbrellas!